(October 18, 2011) China’s South-North Water Transfer Project aims to divert huge quantities of water from the south to the water-starved north, including Beijing. But officials are increasingly concerned that the water may be too polluted to use. This article, from China Radio International – English, describes the steps that officials in Henan are taking to ensure that the water they send is drinkable. From next year on, water quality will become a form of criteria used to evaluate the performance of local officials in Xichuan county of central China’s Henan province. The whole range of ecological indices to be adopted for official evaluation include the quality of water entering Xichuan, the establishment of tree plantations, the control of soil erosion and treatment of garbage and waste water, as well as the number of polluting enterprises that have been shut down. The new evaluation system will cover 17 townships and key enterprises of the county. So why is so much attention being paid to water quality control in Xichuan? 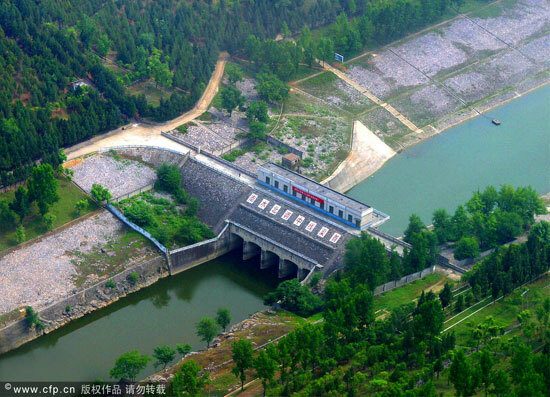 As it turns out, the county is situated at the head of the middle route of the South-to-North Water Diversion Project, which will provide high quality drinking water for a range of cities in northern China once completed, including Beijing. More specifically, the route will relay water from the Danjiangkou Reservoir, starting from the Taocha village, Jiuchong township of Xichuan county, all the way up north through Henan and Hebei provinces, until the water finally reaches Tuancheng Lake near Beijing. The route will run more than 1,200 kilometers. Part of the water will be provided to Tianjin municipality. The water quality monitoring stations around the reservoir also show how much emphasis the government has put on water quality control. At one such station in Taocan, which was put into operation in 2004, equipment imported from Europe tests water samples automatically every four hours and monitors its quality against a set of parameters, such as the temperature, pH Scale, Conductivity, turbidity, dissolved oxygen, Total phosphorus, total nitrogen, and chlorophyll. Read the full article here, or see the original at CRIEnglish.